A Northumberland registrar conducts a wedding at the recently-renovated Northumberland Hall in Alnwick, which is run by the county council. The Northumberland registration team, which oversees hundreds of weddings across the county each year, has won a regional award for outstanding customer service. The accolade was presented at the 2017 North of England Wedding Awards which were held in York last week. 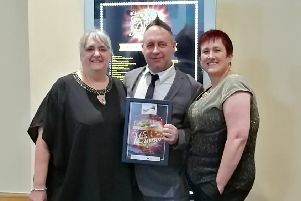 The team from Northumberland County Council were commended for being warm, friendly and helpful and for their ability to make couples feel relaxed and at ease. The team offers a range of ceremonies and this was really appreciated by the couples who felt it made their day feel very special and personal. Northumberland is currently experiencing a wedding boom with a record number of couples booking to tie the knot in the county. Last year, the Northumberland registrars officiated over 1,700 marriages and so far this year a further 1,980 marriages have been booked. Statistics show that around 65 per cent of couples who are getting married in Northumberland are actually coming from outside of the county and weddings bring in up to £30million to the county’s economy each year. Northumberland County Councillor Nick Oliver, cabinet member with responsibility for the Registration Service, said: “There are some really outstanding wedding suppliers in the north so to win this award is a fantastic achievement for the team. “What makes the award extra special is that it is the brides and grooms who have voted. They are an extremely busy team who put a great deal of effort into making sure each wedding is special. The North of England Wedding Awards recognise those businesses which exceed the expectations of their customers, who provide an outstanding service and who inspire their customers to actively and positively promote them.